The VMware View 5.0 environment in the lab has been running well and has proven itself as an extremely reliable remote access replacement for the old Citrix Presentation Server 4.0 solution I had in the past. However, in an effort to address a licensing issue related to the View App for iPad demo environment, I managed to force both a pool and a single desktop from within that pool into a perpetually stuck state of ‘deleting’. In addition, the VM representing the desktop was gone, but I could see from within vCenter the parent replica for the pool still remained. 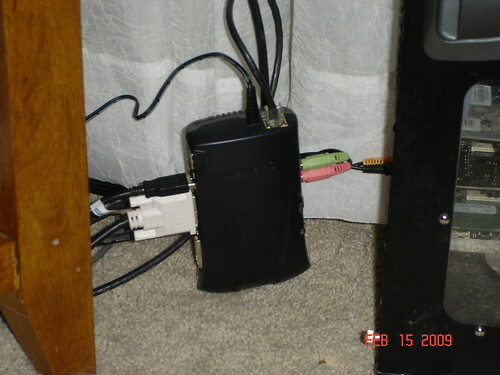 I spent some time poking at it from several angles including the View Connection Server, the vCenter Server, and the View Composer Server. It became clear that the underlying issue was deeper, in a database perhaps, and couldn’t be resolved using the standard management tools VMware offers. This issue occurs if a table in the database has an incorrect data. 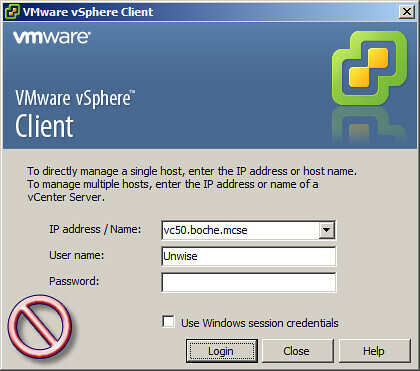 It can also occur if the virtual machine name has been changed in the vCenter Server manually after the pool has been created, causing View Composer and vCenter Server to refer to the same virtual machine with different names. 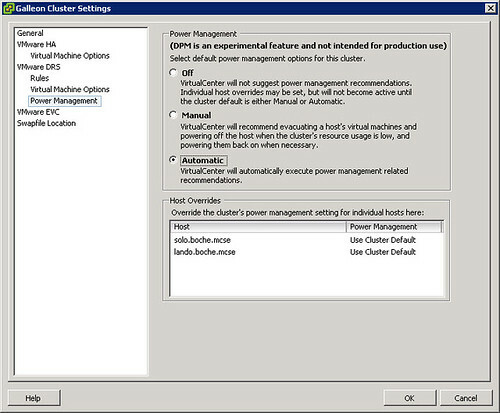 The problem can largely be avoided by managing the View environment with the intended tool – the VMware View Administrator interface as opposed to making changes outside of View, such as using VMware vCenter. Resolving the issue is achieved by following the detailed in the KB articles above. Follow the steps carefully and slowly in a production View environment and keep in mind that not all steps may be required for your particular situation. 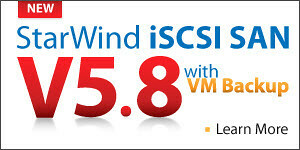 Burlington, MA – January 13, 2012 – StarWind Software Inc., an innovative provider of SAN software for iSCSI storage and VM Backup technology, today announced the release of new StarWind iSCSI SAN v5.8 and Hyper-V Backup Plug-in. The iSCSI SAN software is enhanced by the powerful VM Backup technology that is included as a plug-in. Backup plug-in is built specifically for Hyper-V-based environments to provide fast backup and restore for Hyper-V virtual machines. The backup solution delivered by StarWind performs all operations on the Hyper-V host level thus it requires no backup agents to be installed on virtual machines (Agentless Architecture). Hyper-V Backup Plug-in makes fast backups and allows quick, reliable restore of both virtual machines and individual files. 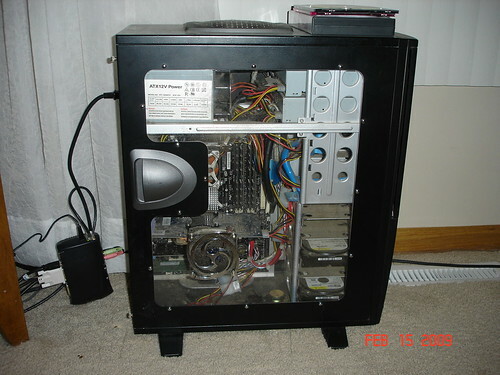 It utilizes advanced technologies for maximum disk space saving (Global Deduplication). This backup tool is integrated with StarWind Centralized Management Console that enables managing backup and storage from a single window. Additionally, a new version of HA plug-in is presented in StarWind iSCSI SAN v5.8 that allows use of raw basic images to create HA targets. A new replication engine based on own technology instead of MS iSCSI transport creates higher performance and reliability. This new engine permits use of multiple network interfaces for synchronization and heartbeat. To simplify the replacement of equipment and recovery of fatal failures, StarWind Software has implemented the ability to change the partner node to any other StarWind server without any downtime and on the fly. Synchronization engine is improved, and this version allows both nodes to sync automatically even in the case of a full blackout of both servers. A few months ago, The Tolly Group released a report comparing Citrix and VMware VDI solutions. They’re at it again. Today, The Tolly Group released another comparison. Today’s report compares Citrix XenServer 5 and VMware ESX 3.5.0 Update 3 with Citrix XenApp as the workload. The testing was conducted in accordance with Tolly Common RFP #1101, Virtual Server Performance. * Citrix XenServer 5 outperforms VMware ESX 3.5 by 41% in user scalability tests. * XenApp, running on XenServer, retains a consistent user experience as load is increased to 164 users. * Virtualizing 32-bit XenApp gives IT administrators a viable approach to increasing total user density on physical servers, without the need to re-certify their existing applications and drivers for a 64-bit platform. * Consolidating XenApp farms on XenServer results in data center reliability benefits and cost savings. Click here to download the report. You will need to register for the report download. I’m mildly excited for the upcoming week. If all goes well, I’ll be upgrading to AMD Opteron processors which support a virtualization assist technology called Rapid Virtualization Indexing (or RVI for short). RVI is found in AMD’s second generation of virtualization hardware support and it incorporates MMU (Memory Management Unit) virtualization. This new technology is designed to eliminate traditional software based shadow paging methods for MMU virtualization thereby reducing the overhead in bullet #2 above. VMware lab tests show that RVI provides performance gains of up to 42% for MMU-intensive benchmarks and up to 500% for MMU-intensive microbenchmarks. Software based shadow page tables store information about the guest VM’s physical memory location on the host. The VMM had to intercept guest VM page table updates to keep guest page tables and shadow page tables in sync. By now you can probably see where this is going: applications and VMs which had frequent guest page table updates were not as efficient as those with less frequent guest page table updates. The above is similar to guest VM kernel mode calls/context switching to access CPU ring 0. Previously, the architecture wouldn’t allow it directly via the hardware so the VMKernel had to intercept these calls and hand-hold each and every ring 0 transaction. Throw 10,000+ ring 0 system calls at the VMKernel per second and the experience starts to become noticeably slower. Both Intel and AMD resolved this issue specifically for virtualized platforms by introducing a ring -1 (a pseudo ring 0) which guest VMs will be able to access directly. 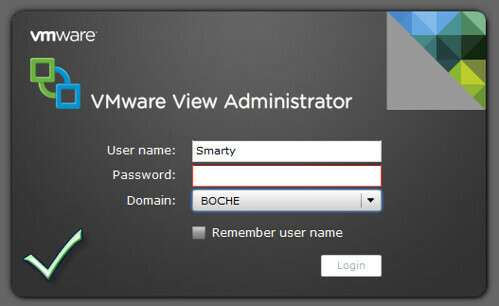 VMware introduced support for RVI in ESX 3.5.0. RVI eliminates MMU related overhead in the VMM by relying on the technology built into the newer RVI capable processors to determine the physical location of guest memory by walking an extra level of page tables maintained by the VMM. RVI is AMD’s nested page table technology. The Intel version of the technology is called Extended Page Tables (EPT) and is expected sometime this year. One of the applications of RVI that interests me directly is Citrix XenApp (Presentation Server). XenApp receives a direct performance benefit from RVI because it is an MMU-intensive workload. VMware’s conclusion in lab testing was that XenApp performance increased by approximately 29% using RVI. By way of the performance increase, we can increase the number of concurrent users on each virtualized XenApp box. There are two wins here: We increase our consolidation ratios on XenApp and we reduce the aggregate number of XenApp boxes we have to manage due to more densely populated XenApp servers. This is great stuff! There is a caveat. VMware observed some memory access latency increases for a few workloads, however, they tell us there is a workaround. Use large pages in the guest and the hypervisor to reduce the stress on the Translation Lookaside Buffer (TLB). VMware recommends that TLB-intensive workloads make extensive use of large pages to mitigate the higher cost of a TLB miss. For optimal performance, the ESX VMM and VMKernel aggressively try to use large pages for their own memory when RVI is used. For more information and deeper technical jibber jabber, please see VMware’s white paper Performance of Rapid Virtualization Indexing (RVI). 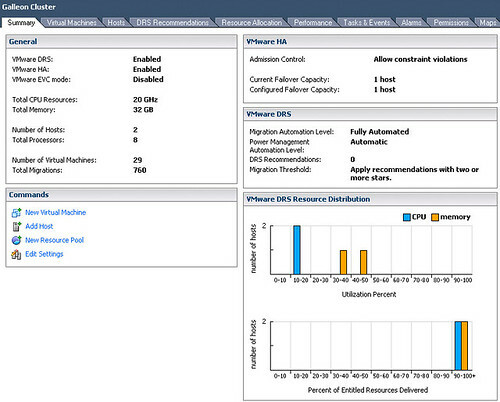 Something to note is that all testing was performed on ESX 3.5.0 Update 2 with 64 bit guest VMs. I give credit to this document for the information provided in this blog post, including two directly quoted sentences. For some more good reading, take a look at Duncan Epping’s experience with a customer last week involving MMU, RVI, and memory over commit.